Last year I merged my GAMA travel and a week in Phoenix into one two-week megatrip. Going away on a two-week trip when I’d never previously been away from the business for more than four days was terrifying. One of the things I asked my managers to do to put my mind at ease was to send a group Facebook message to me and the other managers telling us briefly how the day went and what everyone did. The trip went great. I kept a list on an index card and found that after two weeks, my input was only needed for three minor things. When I got back, I realized how useful those daily messages were. The managers loved them, too, and we’ve been doing them ever since. How: We use a Facebook group chat. We limit it to just me, my wife, and our three managers. If you’ve got a smaller staff you might consider having every employee in this chat, but we have a whole-company employee Facebook group for that sort of coordination, and I don’t like bothering a 16-hour employee with notifications while they’re out living their lives. If you don’t use Facebook, a Google Hangout works great, too. There are other third-party collaboration tools out there for folks that don’t want to use Facebook or Google. I could see the need for an alternative increasing with the size of your staff. Keeps you, the owner, informed at a high level of what’s going on. This message is a good opportunity for an employee to give everyone a heads up about something that is important but isn’t time-critical. Keeps managers (or employees) in the loop on non-crisis items. Provides employees with a motivation to accomplish something every day: My employees know that if sales were poor, they should have something to show for all their time at the end of the day. Provides a way for my managers to keep me and each other posted about ongoing problems and our progress on them. For instance, an intermittent sewer gas leak we’ve been trying to track down, or an employee who got a poor evaluation and is getting special attention until they’re back on track. 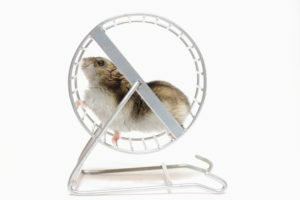 Gives managers that never work with each other a venue for socialization, no matter how limited. 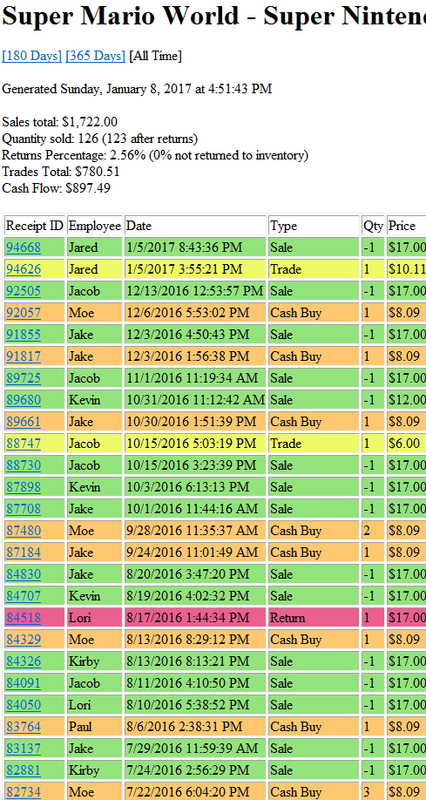 If you don’t have a remotely-accessible POS system, this is a good opportunity to get the daily totals. As an aside: You know what’s NOT mentioned in that update? Anything about video games. That’s because they’re that easy. If you’re going to GAMA, you should come to our Video Games presentation. That’s all I’ve got. I look forward to seeing many of you in Vegas next week! Bring a fan, white noise machine, ear plugs, or all three. The nightclub thumps permeate everything late at night, and even if you’ve upgraded to a nicer room, you’ll want them if you like to sleep. If you’re not from the desert, bring a baseball cap, eye drops, lip balm, and sunscreen. No convenience store there is selling sunscreen this time of year, and it’s important, especially if you’re planning to drive to Phoenix in a convertible after the show. Ask me how I know. Ugh. Wear comfortable shoes. Last year I brought dress shoes and sneakers. I switched to the sneakers halfway through the first day. Dress code: There are no rules, but I will silently judge you if you wear cargo shorts and a dragon shirt. In my opinion, a company-branded T-shirt is bare minimum, and a polo or button-down shirt is better. You don’t have to wear a suit. Would you say that you are a professional? Then dress somewhat professionally. Don’t take bottled water from people on the street. Be aware of the many scams and cons being run and protect yourself. Carry your wallet and phone in a front pocket. If you think you’ll want a car, consider Silvercar. They run a promotion for first-time customers that is very enticing: I got an Audi A4 for the week for $250. They’re in the app store of your smartphone. If you want the box-o-free-stuff from GAMA, you’ll need to attend one of the Premier Presentations in every time slot. These are the pitches from publishers, and they are of variable quality. Last year I went to every one, and I wish I hadn’t. This year I am going to the ones that I have an interest in, and focusing on talking with other retailers the rest of the time. The free stuff just wasn’t worth it for me. If you’re bringing an employee, it might be worth throwing them under the bus to get the freebies. Attend every retailer seminar that you can. These are the reason that I go to this show. Meet as many retailers as you can, seek out the ones that are professionals running profitable businesses, and try to get some face time with them. It’s particularly important to me to talk to the folks who are clearly doing it right while also clearly doing it differently than the way I do things. This is how learning and improvement occur. I hope that you’ll consider attending the presentation that Michael Bahr and I are giving on Tuesday and Thursday, which is simply “Video Games” on the schedule. It is very generous for GAMA to give us a presentation slot, given that they self-describe as an association centered around the non-electronic game industry. Used video games are a high-volume, high-margin category that mix very well with the non-electronic games that I sell, and I’d like to help you get there as well. I’ve sold used video games professionally across multiple jobs for about 12 years combined, and Michael is a more traditional game store owner who diversified into video games last year. You’ll hear the perspective of a video game store that also does non-electronic games, and a non-electronic game store that diversified into video games. If you see me out and about at the show, I’d like to at least shake your hand and hear about your store. If you catch me and ask, I’ll give you a free bracelet that will help you remember what matters in your business. These can also be used with a small zip tie to make a loop that is handy on your keychain. If you’d like to meet with me while we’re both in town, email me or send me a Facebook message. A note on Facebook: I’m very selective about accepting friend requests and I try to keep my current count below a certain number. Just because I don’t accept your friend request doesn’t mean I don’t want to talk to you or meet with you. Monday is looking very busy, but I’m available and eager to chat on Tuesday afternoon and evening, all day Wednesday, Thursday afternoon and evening, and Friday afternoon and evening. Offers of coffee, cheeseburgers, and small numbers of adult beverages are welcome bribes. I am not much of a party-goer, gambler, or sight-seer, but I definitely want to talk about our businesses. About a year ago, in early 2016, I made a short-notice someone-is-closing-their-store trip about two and a half hours away. These trips happen often enough that I keep a bag packed for them, but they’re rarely successful. Usually by the time an owner has decided to bail, they’ve already gone through a series of clearance sales that cause whatever is left to be garbage. This trip was different: The store was fully stocked and hopping. The owner was behind the counter and drunk. I asked him for his story and found out that he was being forced to liquidate the store because of his pending divorce. When I asked him for his sales records and an asking price for all of the assets of the business, he produced them, and I liked what I saw. He and I were standing outside while I looked over his numbers, when a passing bird pooped on the paper and my hand. I probably should have taken this as an omen, immediately wished him good luck, and departed. I asked him on the spot if he would lock the door and sign an asset purchase agreement with me as soon as my attorney could send one over. He said yes, excused himself to the bathroom for twenty minutes, then came back and said maybe. Things kind of went downhill from there, with three increasingly-desperate trips to see him over the next five days. The final trip involved showing up unannounced with $20,000 in a bag. I finally got a handshake agreement to sell me everything in the store if I could get it all out the next day. I rushed over to a storage unit place five minutes after it closed, plunked $100 down, and got a phone call on my way out of the parking lot: The game store owner couldn’t sell me the stuff because there was a bank lien on it. Of course I’d asked him about this three days prior, but he didn’t think I was talking about THAT kind of bank lien. Yeah, it was that kind of a negotiation. I was bummed that I hadn’t been able to execute my plan of signing the agreement, locking the door, and reopening the store six weeks later under my own brand. Still, I had seen his numbers, and I had spent some time researching the town. The town was seriously under-served. I kicked myself for not having the resources to immediately act, but gave myself a plan to open a store there in May 2017. In 2016 I gathered a substantial amount of cash. I hired an additional manager, freeing up one of my existing managers to move to the new town and co-manage the store with me while we built a staff. Hastings’ timely death was the perfect opportunity to get the type of fixtures we use, so I chased Hastings stores all over the state. I put 4,000 miles on my truck in one month. As 2016 drew to a close I poured a few dozen hours into working multi-location awareness into my point of sale software. I made half a dozen scouting trips with my wife and each of my managers, and we picked some likely locations. Christmas was maybe not quite as profitable as I’d hoped, but we seemed to still be in the safe zone for making the expansion happen. If I wanted everything on track to build out and open a location, I needed to have a signed lease by the end of January at the latest. This week I scheduled meetings with five different commercial real estate agents and left for a three-day trip to make my decision about the location. Yesterday I arrived in town, met with my first agent in the most promising spot, and nailed down enough details that all that remained was putting our lawyers in touch. It was scary in the way that buying a house or a new car is scary, and I told my wife that all I really wanted to do was get back to my Airbnb condo and punch numbers into spreadsheets to assure myself that it would be okay. I’ve done this about a dozen times in my life when I or my wife lost a job, or had an air conditioner break, or had our insurance premiums triple (cough). Putting the numbers on paper and planning out my cash flow almost always makes me feel better about a major decision. This time it didn’t. I looked at the number in my spreadsheet representing my startup costs for the new store, plus two months of rent and lights. 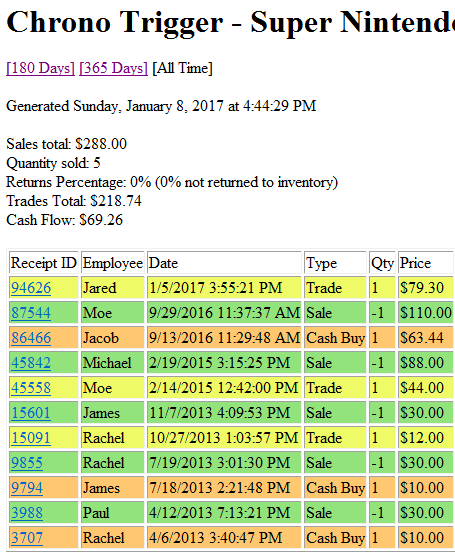 I looked at my cash flow estimates, subtracted out our typical operating cash buffer for my original store, and compared the numbers. They were nearly equal. I could do it safely, maybe? (If you have to qualify something as “maybe safe” then it’s not safe.) If everything went swimmingly, we didn’t have any unexpected setbacks, we didn’t miss any expenses in our planning, and if the store performed reasonably well right out of the gate, then we could make it through the labor and delivery. If anything went wrong, I’d be out of cash. I always held in the back of my head that I was willing to borrow a reasonable amount of money if we ran into a cash crunch. If things went a little more than slightly wrong, I might not realize how much trouble I was in until the debt was sufficient to harm my net income in a long-term way. I asked myself how much cash it would take to make these fears go away, and the answer was in the low six figures. I wasn’t going to go deeply into debt for a business model that could expire five to fifteen years from now. It was at that moment I realized that this expansion wasn’t worthwhile at the price that it would cost to do correctly and safely. In the space of about two hours, I went from normal nervousness, to deep anxiety, to a certainty that it was the wrong move if I wanted to be sure of the future of my first store. I called my wife to let her know what I’d decided, then called the manager who was planning to move to let him know. I sent out emails to cancel my remaining appointments, had an adult beverage, watched an episode of Archer, slept five hours, and came home. Rationally, I knew that there would come a go/no-go moment and I would have to make a decision. I know that I have too many people counting on me to go with a reckless plan when prudence tells me that it’s a close shave. Our culture values hard-chargers and risk-takers highly, but I value this business and the jobs it provides more highly. Emotionally, it’s a mixed bag. I can relax the tightfisted finances I’ve operated over the last nine months. I can make plans that don’t involve working myself half to death. Still, my gut calls softly to my intellect: Coward. Whatever. My gut has crap for brains. I’m going to write some bonus checks and then take a week off. This is a super-crunchy, kinda mathy post, but if you hang in there, you might find yourself making a lot more money running a much better business. When I started this post I wasn’t really sure who it was for. Really it’s most useful to those who are developing point-of-sale solutions for game stores, but there’s not many of those people, and most of my current readers are game store owners. I suppose that this is still useful to them as both an introduction to what I think is an important concept, and an idea of a feature in their Point of Sale solution that they didn’t know they were missing. Customers of POS vendors: You need to be asking for this. I’m going to talk about the problem in terms of video games for the most part, because that’s where it started for me and it’s where I think examples will be the most relatable. I’ve now come to see that this is every bit as essential if you’re dealing in Magic: The Gathering singles. When I first started out, I paid a flat 50% cash on all games. My point of sale system didn’t have an elegant store credit solution, and I knew that I couldn’t kludge one together out of index cards or spreadsheets, so we just paid cash for everything. As time went on, I realized that I was getting far too many of some categories (Playstation 2) and far too few of others (Xbox 360, which was still current-gen at the time). I changed our price update routine so that some systems had different payouts. For example, I paid 25% for a long time on NES games. This was still bad. For NES, I was paying over a buck for Captain Skyhawk and Silent Service, which are two garbage bulk games that few people actually want. Meanwhile, I was making trade-in customers of games like Final Fantasy and Kirby’s Adventure very, very angry. I had a LOT of inventory on the shelves, but it was mostly crap and I paid too much for almost all of it. What little high-quality merchandise I had on hand was the result of us inadvertently taking advantage of someone who didn’t know what they had, or me making exceptions to try to account for the shortcomings of our trade offers. LowPercentage – This is the percentage of your sell price that you’ll pay out in store credit on the low-end chaff. HighPercentage – This is the percentage of your sell price that you’ll pay out in store credit for the high-end, desirable items. LowThreshold – At or below this price, you pay out the LowPercentage trade value. 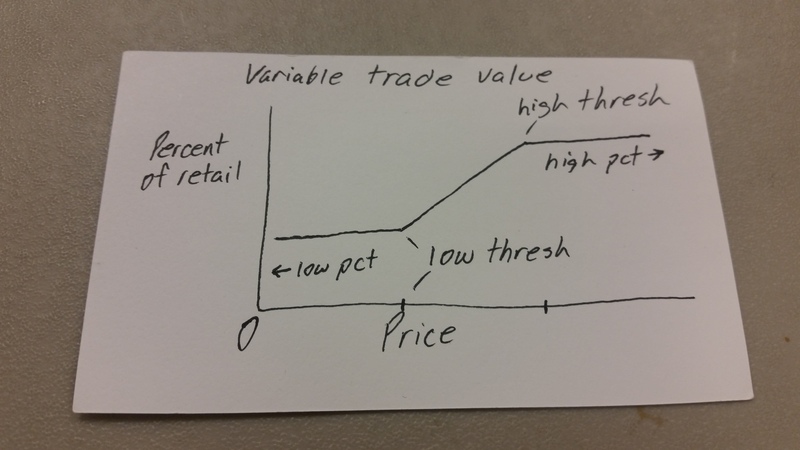 HighThreshold – At or above this price, you pay out the HighPercentage trade value. CashPenalty – The percentage taken off the trade value if the customer wants cash instead of store credit. This photo was taken while eating a sandwich at Desert Sky Games in Arizona the week after GAMA 2016. I taught them video games, they taught me comics. I think I got the better end of the trade. Moving the inflection points of this graph give you a lot of flexibility and power. For categories where the line between good stuff and junk is very fine, you could make the slope of the center line vertical or nearly so. If you want to pay out a flat percentage on a category, you can still do so by setting the low and high percentages to the same number. For categories where the desirability and sales velocity of the items increase steadily as value increases, you could set the LowPercentage/LowThreshold very low and the HighPercentage/HighThreshold very high. 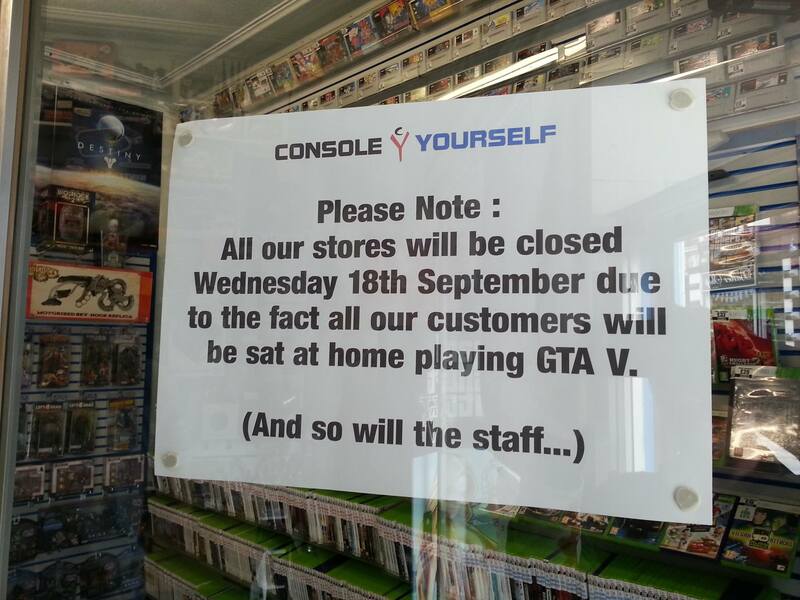 Implementation of this is basically impossible if you’re not running a POS that was designed for game stores. If you look up your prices with a spreadsheet you could probably write this into it, but it would be a pain. In my perfect world, both IMP POS and the Dumpster-Fire Goliath POS solutions would implement this. This is not purposeless fiddling: Very little else in my business changed in the year that I moved to VTV. My total dollars spent on trade-ins dropped by a third, the total volume of my trades increased, and the quality of the inventory I was buying dramatically improved, which meant that sales shot up. My net income jumped by something like 30%. I bought a new vehicle for the first time about six months after I switched this on. These improvements in business process are life-changing. 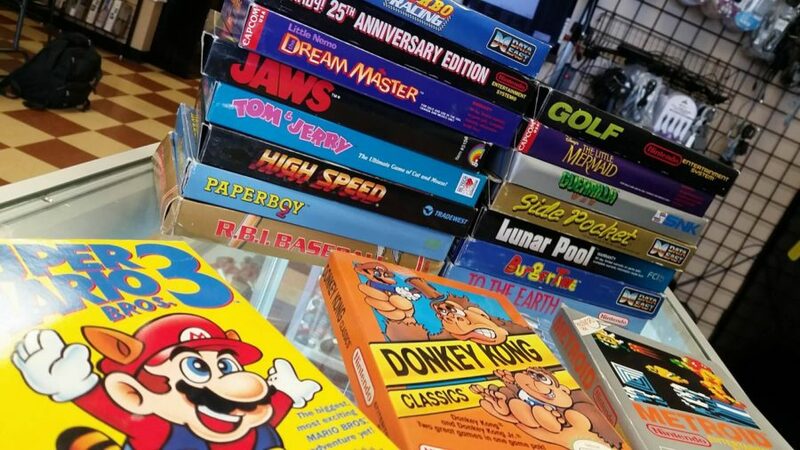 If you sit down and think about the Super Nintendo games on the used market, you’ll probably come to the conclusion that there’s a handful of garbage low-end titles, a handful of high-value games, and quite a few desirable mid-value games in-between. We’ll look at three examples with their current payouts, and I’ll show you some sales numbers for each going back to the implementation of this software in February 2013 so you can see the larger story for each title and how our pricing has changed. This game is bad. We want some copies of it, but if we paid 50% we’d attract dozens of them. At this payout we’re currently sitting on six copies. Chrono Trigger is an amazing game, and even if we marked it well above market value, a copy in good condition would be drooled over frequently and eventually sold. We want to give a fair payout for this game, because most people who are getting rid of it know that they could get $120 if they were only willing to deal with the hassle of eBay. If we were paying out a flat 30%, we’d be offering $36.60, which is not a fair trade offer and would upset sellers. We currently have one copy. In the report below you can see how the value of this title has shot up over the last few years. This is a common, bread-and-butter game that everybody wants, and I could probably get $25 per copy for it without too much trouble. We are currently sold-out in the post-Christmas crush. You can see from the history that it tends to move a little too quickly, meaning that I should think about adjust the pricing manually for both sales and payouts. default_optimal: Each item has an optimal quantity number. This is the default for that field. For most video games that’s 12. For Magic singles it might be 8, or 16, or 32, depending on how deep you want to stock. You can always adjust this for individual items if the need for an exception strikes. over_optimal_penalty: This is the percentage taken off of a trade if you have over the optimal quantity. default_excessive: This is the default for the excessive quantity, which is like optimal quantity but far higher. This is the “hey, there’s something wrong” number. For video games that’s 20 for us. over_excessive_penalty: A very high percentage taken off if the quantity in stock is over the excessive number. Here’s the category spreadsheet with all of our values. You can see that many of them are the same. This is one of those 80/20 things where you get the most impact from a relatively small amount of effort. If I wanted to fiddle with it more I could probably squeeze out more efficiencies, but I am trying very hard not to fiddle for a living. 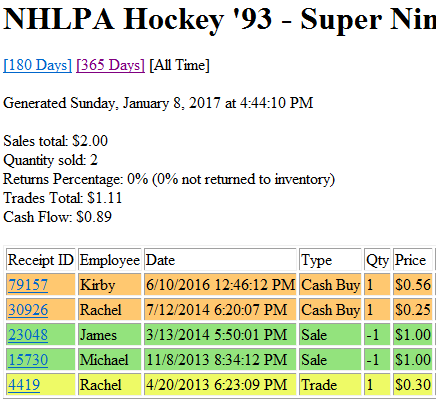 It isn’t a super-pretty spreadsheet, with lots of depreciated categories and placeholder values on categories that aren’t price updated regularly, but if you’re data-minded this will help. Video Game pricing comes from PriceCharting and MTG pricing comes from exports of TCGPlayer‘s price data via Gatherer Extractor, since they won’t give out API access to stores for love or money. How do I say this in a way that is not legally actionable? I think that Crystal Commerce is awful. 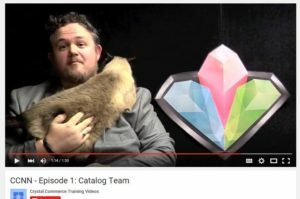 We attempted a migration to Crystal Commerce in 2012. 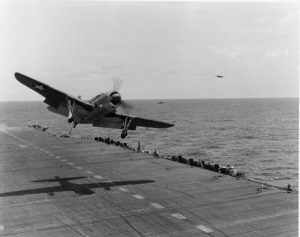 Promised features were not present, and promised development did not take place. We cancelled our service, and it did not go over well. Someone called during dinner to ask me to apologize to their CEO, because apparently he was really upset and it was hard to get anything done in the office. I avoid them at trade shows. After that disaster, I was able to finally put my Computer Science degree to use, creating a point of sale system that isn’t very good but which my employees adore. It should be a foretaste of what I’m going to say about the state of game retail technology that it made more sense for me to spend hundreds of hours developing software for my one 1,700-square-foot store than to make someone else’s solution work. Of course, almost nobody was in the fortunate situation I was in. See, it’s my considered opinion that the entire tabletop game retail scene is propped up by Magic: The Gathering. That isn’t the impression you’d get from looking at pictures of game stores, or from talking to the owners at trade shows. They’re not talking about Magic. They’re talking about Third Place theory and board game nights and hand-selling the new hotness in the short space of time between it getting popular and it getting sold dollars over wholesale on Amazon. Some of these guys are seriously good at running game stores, but if you poke them in the chest long enough and listen to the little bits of information that slip through the cracks, you’ll learn or infer that the biggest category for most of them is Magic. It’s been Magic for years. Hundreds of people who call themselves board game store owners walk the halls of GAMA, hoping that nobody finds out that a pie chart of their sales categories look like a Pac-Man named Magic is about to devour the rest of their business model. Not that there’s anything wrong with that, but I want to make sure you understand that most of these people have to make Magic move through their cabinets, or they will have to go get real jobs. If you want to make money in Magic, you probably have to deal in singles, which is a kind way of saying that you sling used cardboard for a living. If you want to deal in singles beyond the four walls of your store, you are almost required to deal with TCGPlayer.com. If you want to sell on TCGPlayer at any kind of scale, you have to have a way of making mass updates to your inventory. You can either manually enter this data on a regular basis (and give up on having unified cabinet/online inventory), or you need a point of sale system that integrates with TCGPlayer. Do you want a point of sale system that integrates with TCGPlayer? You have to use Crystal Commerce. TCGPlayer used to advertise that they offered integration with outside software, but now they tell you to just get a Crystal Commerce account. Nobody in retail is quite sure why this is. I figure that either they are under some sort of contractual agreement giving their existing partners exclusivity, there’s some deep-seated underlying dysfunction over at TCGPlayer, or they’re unwilling to go any further down the rabbit hole of crushingly-bad game store technology than they’ve already been dragged. 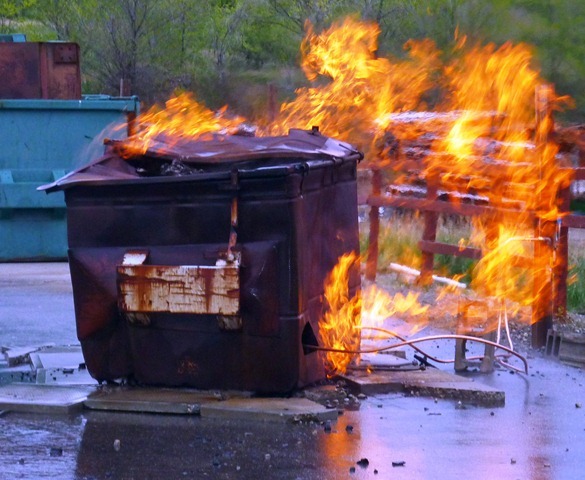 Most retailers are stuck with a dumpster fire solution that has literally had days of downtime for even basic point-of-sale in the last six weeks. They despise it, but they can’t leave. The most promising alternative is from one guy coding in the back of his game store. He’s got pluck, and he’s doing good work, but he’s a small operation. There is no big software company looking to pick up the challenge and run with it, because there is not much money to be made there. I fear for my friend for the same reason that I refuse to sell my own POS solution to other stores: Precious few in our industry are making enough money to pay what a good solution is worth. An enterprise-level solution to this problem would cost six figures, but retailers will balk at a $199-a-month service package. Have a look at the support board for the existing solution, and ask yourself how much of that you’d be willing to put up with for the paltry amount that most retailers would be willing to spend. Game retail is small because it’s mostly bad. It’s mostly bad in part because it’s got a shortage of well-developed process and technology. It’s got a shortage of well-developed process and technology because there’s no money. There’s no money because game retail is mostly bad. Welcome to the Incompetence Trap. I don’t have a solution, but I admire the perfection of the problem. Will somebody deliver us from this body of death? Will we escape the Incompetence Trap before the eventual end of Magic makes it a moot point? I don’t know, but while we wait to find out, there’s lots of great TV. The number and happiness of your employees doesn’t matter. Having nice shelving and a freshly-waxed floor doesn’t matter. Having clean bathrooms doesn’t matter. Being satisfied with your business doesn’t matter. What kind of car you drive doesn’t matter. Your great location doesn’t matter. Your store’s community doesn’t matter. It doesn’t matter how often your kids get to see you. Your gross sales figure doesn’t matter. Nobody gives a flying flip whether you’re doing what you love. The number of your peers that want to talk to you at a trade show doesn’t matter. Your charitable contributions don’t matter. How much cash you have in the bank doesn’t matter. Your Point of Sale system doesn’t matter. How many locations you operate doesn’t matter. The only thing that matters is net income. Until you have sorted out your net income, none of the other stuff matters, because you will lose that anyway. If you think that you might have to pick something–anything–over net income, then you need to get out of your business and get a real job. At a real job there’s work-life balance, and your employer is nominally prohibited from taking away whatever that thing is that you think is more important than your current business’s generation of net income. As it is, you can’t have two number-one priorities. Choose this day whom you will serve. All of the things in the list above are awesome and super-important, but if you’re in business for yourself then the first and only question must be: What is your take after all expenses have been met, and what can you do to get that net income number to an acceptable level? If you’re carrying the products you love and only those products, but you’re not making money, you’re not going to be carrying any products soon. If you’re building a great community in your store but you’re not making money, that community will soon be gone. If you’ve got lots of clever ideas and get featured on websites but you’re not making money, you’re going to lose your store. Not very clever. If you’re able to take off whenever you want and spend lots of weekends with your kids, but you’re not making money, then you’re going to lose that control over your life when your store goes out of business and your personal bills start coming due. Only after your net income is present and accounted for can you start asking what else might matter. This is a tough thing to require of yourself, and it wouldn’t be wrong to shrug it off and go get a jobby-job. Business ownership is a tough racket (NSFW). There is no net. You have no employer to be understanding when you phone it in for a month because of something else that’s going on in your life. Let’s review. What’s important? Net income. Say it with me: Net income. I know that you just read that instead of saying it out loud. Try again, even under your breath. Come on. Ready? 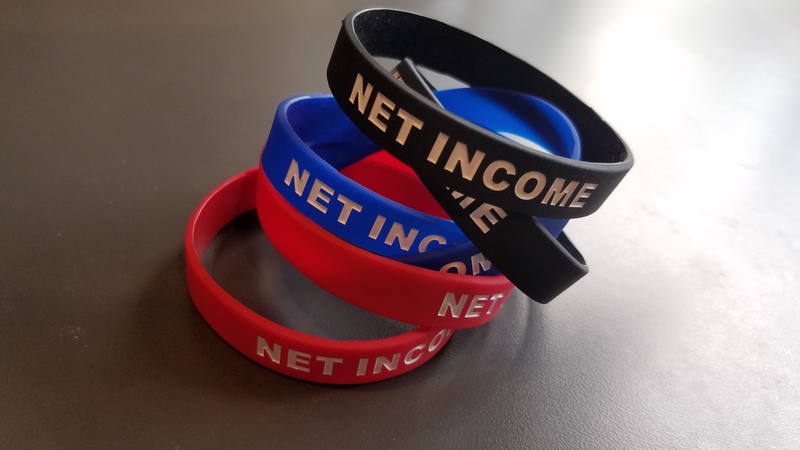 Net income. It’s ten o’clock. Do you know what your net income is this month? What are you going to do about it? I suppose it’s some combination of election-season jitters, a lackluster Magic release, and normal October retail awfulness, but a bunch of my retailer friends are in distress, and well over a dozen of them have contacted me in the last two weeks about video games. 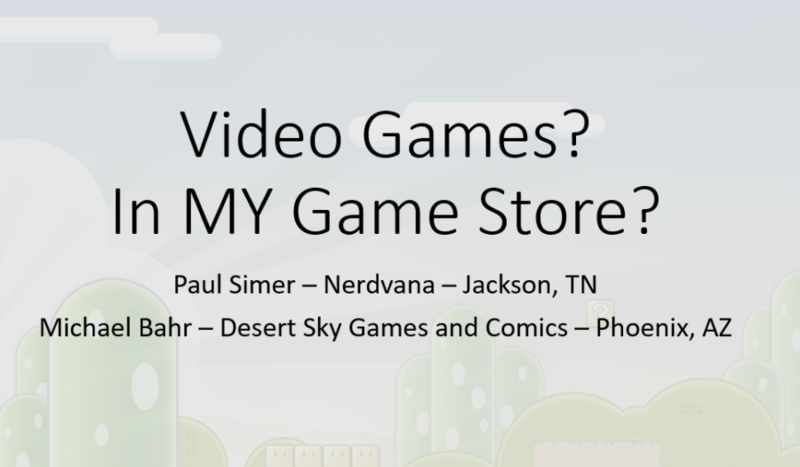 I’ll be giving a presentation in March at the GAMA Trade Show about diversifying your game store into video games, but here’s a FAQ post containing the most common questions that I’m receiving. I’m still happy to answer your questions if this doesn’t cover them, so leave them in the comments. Where do you get new games? I don’t. I deal in used games, consoles, and accessories. I buy some new accessories from Hyperkin, who are awesome. New games and consoles are terrible, low-margin, high-risk sellers. A $60 video game typically wholesales for $52-$54, and if it’s a turd the market price can drop to $40 or $20 without warning. You will not be able to negotiate price guarantees or returnability for your independent game store. I have been selling used-only for five years. It’s possible and easy to do. How much money can video games make me? I’m more willing to discuss specific numbers privately than I am to post them on Al Gore’s Internet for everyone to see, but suffice to say that I could keep my doors open, pay a couple of part timers, keep the lights on, pay the rent in a very good location, and pay myself a very modest salary. I would not be in just the video game business, but in combination with tabletop games and electronics repair, I make an excellent living and provide for a bunch of people. How do you price your games? How do you get this stuff into your Point of Sale? PriceCharting provides an excellent price guide that you can look up game-by-game or download as a big spreadsheet. I have a subscription to the price guide and my point of sale downloads the new prices automagically every night. You may be able to import this price guide directly into your POS system. If you have CrystalCommerce, and your admin panel isn’t currently on fire, they have pricing data and covers and stuff. Nate Peterson’s IMP POS is an upstart alternative that shows potential and also takes care of pricing for you. How much do you pay for games? I started off paying 50%, cash or credit, for everything. This grew my inventory quickly but resulted in a lot of low-value junk. What if you gave a quarter for any Magic rare? Yeah, it’s like that. We ended up going with a variable trade value scheme that changes the percentage we pay for a game based on the sell price. This prevents the problem where you have to choose between paying a too-high rate on cheap bulk games and a too-low rate on valuable high-end games. My rates vary between 20% and 80%, but most games are under 50%. Don’t people try to sell you stolen stuff? Yes. Take ID and make a record of every trade-in. If your point of sale system doesn’t allow you to attach customers to transactions in order to track them, you’ll want to fix that. Don’t take trades from people who creep you out, and don’t hesitate to call your local constabulary if you feel that something fishy is going on. I deal with this perhaps three or four times a year. 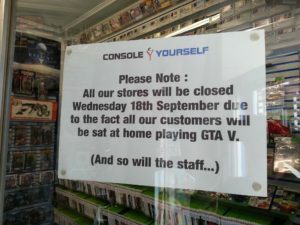 Won’t it change the culture of my game store to have all these video gamers come in? You are going to get a wider variety of customers than you are used to, but it’s an opportunity, not a liability. I thought you wanted muggles to come in to your store for conversion into meeples? I never thought that store owners would be concerned about lots of new customers, but I have gotten this several times. How much space do I need? How do I display this stuff? Figure on devoting 300-600 square feet of shoppable retail space to the category, in addition to two four-foot display counters and maybe a small closet’s worth of extra storage and supplies. More is better, but you don’t need much on the whole. Gridwall or slatwall displays will work. Bookshelves will not work. How much do I need to invest up front? Not counting fixtures? Figure on making a $500-$800 Hyperkin order first thing. You’ll also need to spend a couple hundred bucks on some solution for storing CD/DVD media behind the counter. You need a small TV to test systems. You need to be ready to spend several thousand dollars in cash buying games and systems off the street, and you need to spend some money advertising on Facebook that you’re the buyer with CASH IN HAND for their video games. When I open my second store next year I plan to spend five grand over three months getting the word out. Can I get effective results on a near-zero budget? No. I can only help you be a professional retailer. I don’t know how to help hobbyists. How do I get into this category in time to be effective for Christmas? You don’t. It’s October 27th at the time of this post, and it’s too late to bring in enough inventory from the street to be anything other than pathetic for the holidays. After the holidays is tax refund season, where sales continue to be strong and trade activity scarce. When everyone runs out of tax refund money in April or so, trade-in season starts. That’s when you want to strike. Of course, it’s possible to either overpay for inventory on eBay or buy out a closing store. If you’re buying out a store, avoid the deal if the store has been running any kind of pre-close clearance sale. You can get started with garbage inventory, but you shouldn’t. You’ll regret it. I can’t make my November rent payment and I need to make a change in the next six weeks, or else. I can’t help you if it’s gotten this far. Go to a quiet place tonight after you close tonight, look at your store’s profitability over the last six months, and determine whether you’re collapsing or merely failing. If you don’t have a plan for making expenses other than hoping for a miracle, it’s time to be a grown-up and start moving toward responsible closure. As a totally heartless aside, I buy out closing stores. Contact me, and maybe I can help you get out without losing your shirt.